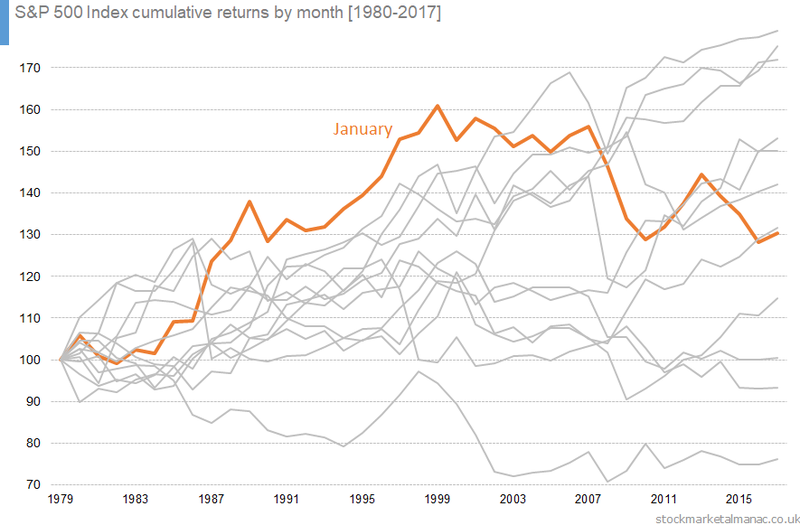 The following chart plots the month returns of the S&P 500 Index for January for the period 1980-2017. The characteristic of the market in January seems to have changed around the year 2000. In the 20 years from 1980 to 1999 the S&P 500 index only fell in 5 years. But in the 18 years since 2000 the index has fallen in 10 years. Further analysis of the S&P 500 Index in January over different periods can be seen in the following table. 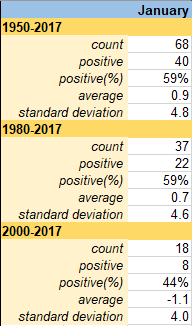 In the 68 years from 1950 to 2017 the Index had an average month return in January of 0.9%, and saw positive returns in 59% of years. 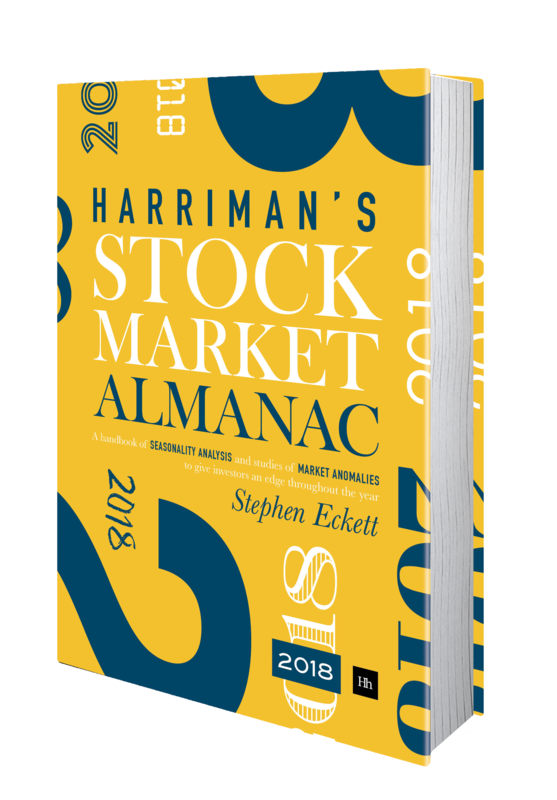 But since year 2000 this has dramatically changed, with an average month return of -1.1% and positive returns seen in only 44% of years. Since 2000, January has the weakest record of performance for the S$P 500 Index. The following chart plots the cumulative returns from 1980 for 12 portfolios, where each portfolio invests each year exclusively in just one of the 12 respective months. (and is in cash for the other 12 months of the year). The best performing month over this period has been April, investing in just the month of April each year would have grown an investment of $100 in 1980 to $179 in 2017. The worst month has been September (the bottom line in the following chart): a $100 investing just in the month of September would be worth $76 by 2017. The cumulative portfolio for January has been highlighted in the above chart. 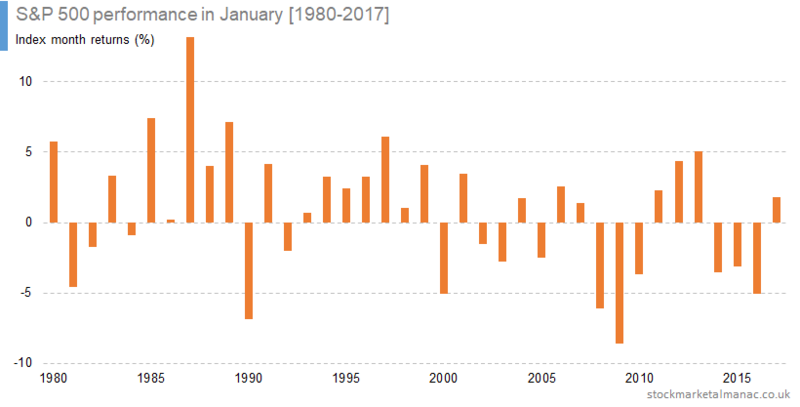 It can see that by year 2000, January was the strongest of all the months in the year, but that record changed after 2000. By 2017 the $100 would have grown to 130. The United States presidential inauguration day used to be on 4th March, but in 1937 the Twentieth Amendment changed the date of inauguration day to 20 January. If that day is a Sunday, inauguration day is moved to 21 January. Has this day had any significant effect on the stock market? The following chart plots the daily returns for the S&P 500 Index for inauguration day (ID) in the years from 1953 to 2009. 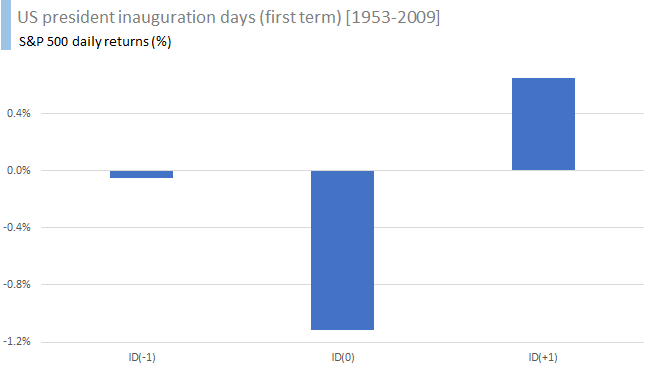 Note: the chart only includes inauguration days for first terms (on the grounds that the market most likely knows what to expect with second-term presidents). As can be seen shares have been weak on inauguration days. Since the 1963 inauguration of Lyndon B. Johnson the S&P 500 has been down on every inauguration day. The following chart plots the average daily returns for the S&P 500 Index for the trading day before inauguration day, the day itself and the day after. 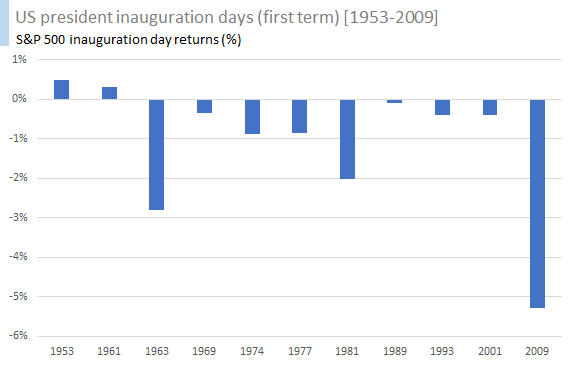 Since 1953 the average daily return for the S&P 500 on inauguration day has been -1.1%. For the day after ID the average daily return is 0.7%, so there does seem to be a partial relief rally afterwards. 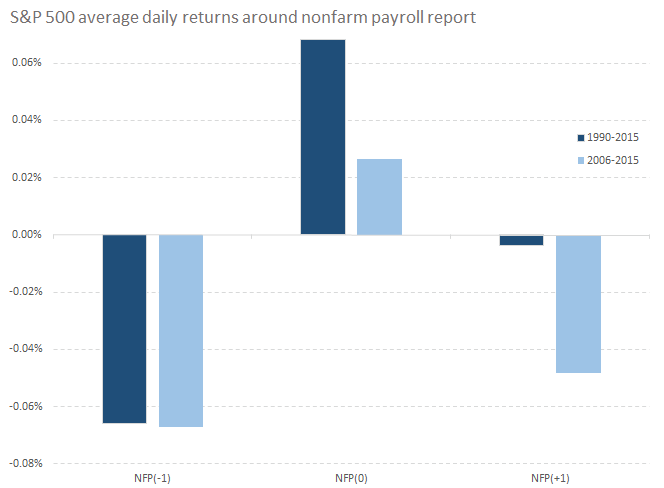 There are many statistics released every month by the U.S. government that investors follow to assess the strength of economy, but one of the most important and widely followed announcement is the nonfarm payroll. This statistic is released every month by the U.S. Bureau of Labor Statistics; it gives an overview of the employment situation in the U.S., not including – as the name suggests – farm employees and also a few others such as employees of the government and non-profit organisations. Nonfarm payroll employment rose by 215,000 in July.. It is the monthly change in employment (rather than the overall employment number) – and the deviation from the expected figure – that is watched closely. The monthly nonfarm payroll statistic can have a large impact on financial markets, primarily the US dollar, but also equities and gold. Regarding foreign exchange there has been a small negative correlation between the NFP data and the US dollar Index. Below we will look at the impact on equities. The analysis shows that since 1990 the S&P 500 Index on average experiences a negative return (-0.066% ) on the day before the nonfarm payroll announcement, a positive return (+0.068%) on the day of the release, and again a negative return (-0.004%) the day afterwards. In the last ten years, 2006-2015, the behaviour profile has largely been the same, except the average positive return has been less on NFP day, and the negative return greater the day after. For reference the average daily return on the S&P 500 Index for all days from 1990 has been 0.03%. On this day in 1959 Spirax-Sarco Engineering listed on the LSE. The following chart plots the average monthly out-performance of the shares over the FTSE 100 Index since 1988. For example, on average Spirax-Sarco Engineering has out-performed the FTSE 100 by 5.0 percentage points in March. The strongest month for Spirax-Sarco Engineering shares relative to the market has been March (the shares have out-performed the market in this month in 20 of the last 23 years). The weakest month for Spirax-Sarco Engineering relative to the market has been July (the shares have only out-performed the market in this month in 10 of the past 24 years). Spirax-Sarco Engineering is in the FTSE 350 Industrial Engineering [NMX2750] sector.